Despite what the look on my face suggests, I am genuinely so happy with these new boots. 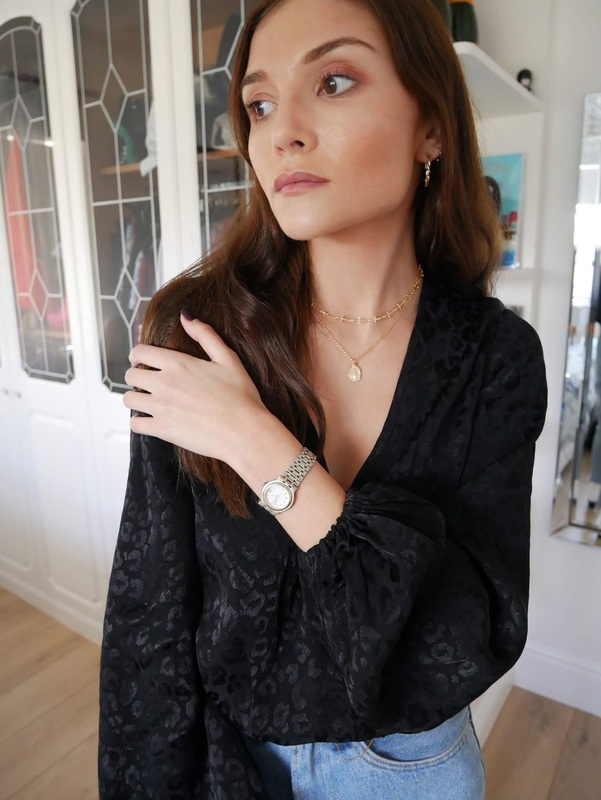 I thought I'd do a quick post featuring some gems I've invested in, from new gold jewellery to on-trend statement boots. Read on for my verdict on transitioning from silver to gold and classic black boot to bold white. Times are changing. Each year when the weather gets colder and the rain starts pouring, I admittedly experience a bit of sadness regarding the loss of summer. However, I then remember it's time to buy new boots and all is g again. Boots are by far my favourite form of footwear and generally my fave thing to buy. They can make a boring outfit a hell of a lot more interesting (especially if they're bright white), and they look so good and leg lengthening (providing they have a heel) with dresses, workwear, jeans... literally anything, essentially. This season, the white boot trend is continuing, and TBH I usually stick to boring black because they go with everything, they're easy to keep clean and so on, but after almost 24 years (I'm sure I started shopping aged one) of investing in a classic black ankle boot every September, I decided I was ready for a change. The white boot was happening. I bought a couple of pairs from Asos – both of which are linked in the widget below – one Western style, one with more of a heel – and despite only buying the Western style ones as a bit of a 'Oh, whatever, they're half price' back up, I like them so much more than the others. They're just that bit shorter in the leg, so go perfectly with cropped jeans, and they're also ticking off the Western trend – what a win-win! Jewellery is another one of my style staples, to me an outfit just doesn't feel complete without the small details being perfect. For years, I have been obsessed with my collection of Rock 'n Rose and Dixi rings, which you can see here, but I decided a couple of months ago it was time to transition to gold jewellery. I say transition cos it has been a long and drawn out process of sourcing the perfect gold necklaces, hoops and watch. If you think you can just pop out and pick up a whole set of gold jewellery – you may be right, but I definitely couldn't. I was down to just the watch that needed changing when I visited my cousin and noticed she had started wearing her mum's old gold and silver chain link watch (this probs isn't the technical description). It looked really cool and I knew my mum had a very similar one back in the day, so that has now been nabbed ty Andrea. I've linked a similar one below but deffoz ask your mum if she has one chilling in her jewellery box first, it's likely. I'm loving these cheap as chips gold hoops too, you can see a bit better in the product image below, but rather than being standard gold plain hoops, they're vintage in style and just a bit more interesting.